Robert Pilot was influenced by the French Impressionists during his studies in Paris from 1920 to 1922, and became one of Canada’s most important Impressionist painters. Impressionism played a significant role in the development of modernism in Canadian painting, as Canadian artists studying abroad returned home to rediscover the beauty and uniqueness of their own country through new eyes and techniques of paint. A growing mood of nationalism was bubbling to the surface, and both critics and cultural commentators were expressing a desire for a truly Canadian iconography. The new influences Pilot discovered in France were reinforced by his stepfather, well-known Canadian Impressionist Maurice Cullen, whom he accompanied on sketching trips. Pilot’s Quebec urban scenes and landscapes of the Quebec countryside are known for their sensitive atmospheric effects. Mont-Tremblant was named Manitonga Soutana (Mountain of the Spirits) by the Algonquin people, who claimed that if anyone disturbed the area’s tranquility, the spirits would make the mountain tremble. 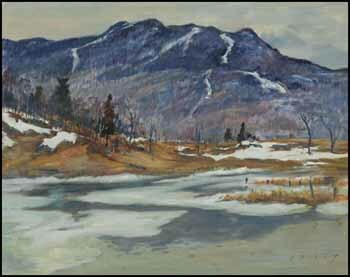 The soft ambient light of a high overcast winter’s day is captured through subtle tonalities in this perceptive depiction of mythic Mont-Tremblant in the Laurentians.